Posted on August 21, 2016 at 11:59 am. Is your boiler in need of a qualifying service for warranty requirements or an annual service and safety check? IF THE ANSWER IS YES……PLEASE READ ON. Vaillant or Glow-worm 1st, 2nd 3rd or 4th year warranty qualifying boiler service advice. If you are a Vaillant ecoTEC plus / pro or Glow-worm owner you will need a Vaillant or Glow-worm SPECIALIST ENGINEER to carry out the required boiler service. The service is a must, otherwise your warranty / guarantee ( which could be up to 10 years ) MAY NOT REMAIN VALID! Don’t panic….help is at hand straight away! GLOWCARE are Vaillant and Glow-worm’s SPECIALIST ENGINEER’S for the North West of England. With expert knowledge and know-how of these boilers, we have been the manufacturer’s continuous SERVICE AGENT since 1992, providing expert service repair. We are very reasonably priced and have lots of super happy customers, please check our testimonials. Posted on June 2, 2013 at 7:14 pm. You know, the type of luck that gets you next to a huge star of the music business. Its unexpected, but nevertheless you are indeed there, with them, that type of luck. Here’s the story! Who could this possibly be? I’m in Manchester, normal day, attending the repair of a leaking Saunier Duval combi boiler. Invited in, upstairs, through into the bathroom, take the front off the boiler, looking at a leaking pump block. Nothing out of the ordinary so far then? I’m working on the boiler, bloke comes in, starts telling me all about how and when and where the leak was in the boiler etc. Some more nice chat for a further 10 minutes or so. Then it struck me! Oh my God, its him, I’m sure it is, isn’t it? I’m getting excited now, we talk some more. I thought (being a bit older than him), I know how I can turn this into a bit of a laugh, just like I do everyday with our usual Glowcare customers. We’re still standing there talking, eye-ball to eye-ball, I thought, how am I going to do this? On his shirt I’d noticed he’d got a sort of badge, above the pocket (really excited now, here I go)! “Are you a service engineer?” I said to him (being one myself). “No“, he replied, surprised! “What do you do“, I quickly said, “I’m a singer“, he replied smiling slightly. “Are you any good?” I asked. “Not bad“, he said, with the biggest smile ever!! Even though I was taking the mickey a bit, he started to laugh, “do you recognise me?” he said. Guy Garvey, the brilliant and world famous lead singer of Elbow, was my customer that day! What a joy, absolute magic! and a top bloke. 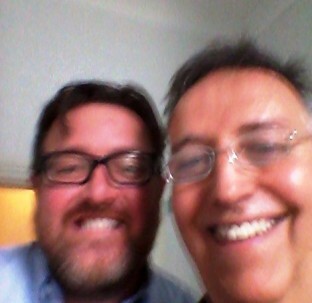 Elbow lead singer Guy Garvey with Graham from Glowcare, after boiler repair. Thanks Guy for allowing us to use this picture and telling the story! © Glowcare and the Glowcare Blog, 2013. Unauthorized use and/or duplication of this material without express and written permission from this blog’s author and/or owner is strictly prohibited. Excerpts and links may be used, provided that full and clear credit is given to Glowcare and the Glowcare Blog, with appropriate and specific direction to the original content.